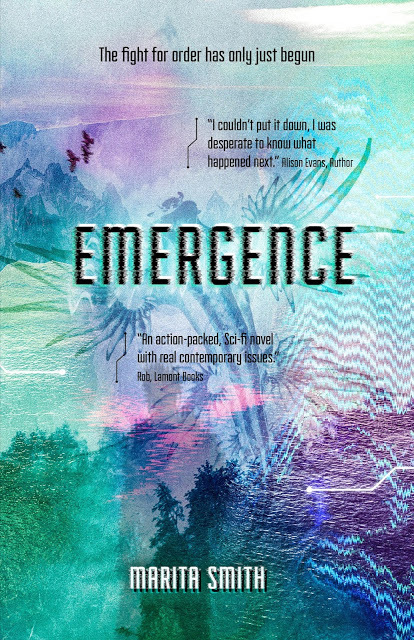 Today at the Speculative Fiction Showcase, it gives us great pleasure to interview Marita Smith, whose novel Emergence was our featured new release on May 7, 2018. Emergence is the second book in the Kindred Ties Trilogy. Your bio describes you as a paleo-biogeochemist. How important is your knowledge of science to your writing? I think it’s intrinsic to the way I write; science permeates everything! I remember sitting in lectures at university daydreaming about potential applications of molecular jugglery, geology, electromagnetic radiation, evolution….an understanding of natural phenomenona has changed the way I interact with the world, and I love being able to express that through my writing. Tell us a bit more about the Walkers and their present day incarnations. The Walkers are part of an ancient reincarnation cycle designed to keep the Earth in balance. 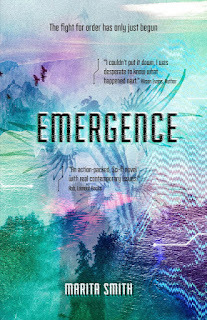 In Emergence, we learn more about this cycle and its ancient origins. The present day incarnations are three sixteen year-olds, each with the ability to communicate with animals of a particular biome: Eli (Air), Fletcher (Earth), and Ariana (Water). What is the Convergence gene and could such a thing exist in real life? The Convergence gene is a mutation on the mitochondrial gene sequence that enables a person to form a telepathic bond with a unique animal partner. The Walkers alone have the unique ability to communicate with all animals from one of the three biomes of air, earth, and water. Our mitochondria, which produce most of our cellular energy, are the result of an ancient symbiosis event. It’s pretty miraculous (and terrifying) that all multicellular eukaryotes (us included) would not be here today unless one prokaryote engulfed another, billions of years ago. What if this organelle has an even more important role, one that has lain dormant and long forgotten? What if a mutation on the mitochondrial gene sequence enabled humans to communicate with animals? Who or what are the antagonists in this story, the MRI? What do the initials stand for? The Mitochondrial Research Institute (MRI) is a genetics organisation aware of the existence of this incredible ability, actively hunting down teenagers with the Convergence gene around the world for their mysterious (and sometimes lethal) experiments. You do not want to end up in one of their research compounds, trust me. will imperil the entire planet.” How do the elements of fantasy and science interact? The story definitely draws from both science fiction and fantasy. Science is the backbone for the convergence between humans and animals, but I also incorporate a parallel universe, the spirit world, which only the Walkers can enter through meditation. The Walkers’ abilities are tied to the existence of ancient spirits composed of pure energy that can traverse the boundary between worlds. In the spirit world, the Walkers’ animal partners can assume almost any form; my favourite is Jericho (Ariana’s salamander) – he turns into a dragon! Do you have any other works in progress? I’m currently busy working on Book 3, which will be released early 2019. A paleo-biogeochemist is someone who analyses really old stuff (paleo) left by living organisms (bio) in ancient sediments and rocks (geo) using chemistry (chemist). In my thesis, I studied organic compounds left by algae and archaea deposited on the sea floor around Australia. By comparing ratios of particular organic compounds (called molecular fossils, because they are long-lived, like dinosaur bones) it’s possible to reconstruct ancient sea temperatures. Pretty neat, huh? I am intrigued by the suggestion that chemistry is a language in its own right. Can you tell us more about what you mean? Chemistry enables me to see the world in a different, more visceral way. Thermodynamics, crystal structure, enzymes, haemoglobin…there is so much depth to the phenomenon we take for granted around us, whether it’s occurring at the top of a mountain or in each of our cells. Chemistry is Earth’s language. You have travelled widely – has your experience when travelling influenced your writing? In 2013, I spent a year working on organic farms in the UK alongside people highly attuned to natural rhythms. I woke with the sun, planted according to the lunar cycle, and ate just-picked vegetables at every meal. I was also writing a journal article based on my honours research and delving into the latest Intergovernmental Panel on Climate Change (IPCC) Report. The disparity between the two worlds was alarming. By day, I was helping create a sustainable future; by night, I was churning through data detailing the steady degradation of the planet by human hands over the last few centuries. When I returned home to Australia, I was struck by how readily we take natural resources for granted and the sheer volume of stuff we consume. There had to be a way to find balance, to create a world where humans lived in harmony with the Earth. It struck me that long ago, perhaps we did. Maybe we took only what we needed, and lived alongside plants and animals, just one part of the evolutionary tree of life. Are you working on the third book in the trilogy and what do you foresee for the concluding volume? I’m currently busy working on Book 3, which will be released early 2019. The final book is shaping up to be my favourite – we’ll see the Walkers really mature into their roles, with plenty of action! What are you reading at the moment, inside or outside the genre? I always tend to have a non-fiction and fiction book on the go. At the moment I’m reading Guns, Germs, and Steel: The Fates of Human Societies by Jared Diamond, and have just finished Emily Suvada’s This Mortal Coil (which was brilliant!). Can you name seven books that have had a great influence on you? The Ender’s Game series by Orson Scott Card – I read these when I was young, and they’ve really stuck with me. I loved the world, the science, the terminology, and how smart and able the Battle School kids are (Bean will always be my favourite). Dune by Frank Herbert – another book I read when I was young; the beautifully crafted Arrakis will always be with me. Fall on Your Knees by Ann-Marie MacDonald – The first time I saw myself (as a budding baby queer) in a story. Ahab’s Wife by Sena Jeter Naslund – I took this with me on my travels, and it’s a BIG book to lug around. That’s how much I love it. Snow Crash by Neal Stephenson – all of his novels take interesting scientific, historical, and philosophical concepts and mash them together until your brain explodes with new possibilities. Just, wow. Children of Time by Adrian Tchaikovsky – the evolutionary narrative, the science – I adored this book. Tchaikovsky creates an alternative history that challenges human superiority to the very core. Sapiens: A Brief History of Humankind and Homo Deus: A Brief History of Tomorrow, by Yuval Noah Harari – an insightful examination of humanity’s insatiable quest for connection and to understand our place in the universe and the energy that surrounds us. Marita Smith is an author, editor, and gourmet mushroom grower. After finishing a PhB (Hons) in Science at the Australian National University, she worked as a paleobiogeochemist in the Netherlands and then vagabonded her way across Europe working on small farms. She now lives in a tent on the NSW South Coast, where she writes young adult science fiction, cultures bioluminescent fungi, and hangs out with her donkey, Mindy. We are a blog about all things indie science fiction, fantasy and horror. Read interviews with and guest posts by spec fic writers and keep current on news from the SFF world and the latest spec-fic releases.